Immer wieder habe ich bei bto aus Studien des angesehen Bostoner Vermögensverwalters GMO zitiert. Bekannt sind die jährlichen Berechnungen zu den künftig zu erwartenden Renditen. „Your portfolio likely lost money last year. It wasn’t in a catastrophic, 2008 kind of way, but I am reasonably confident in saying that for U.S. dollar based investors reading this, 2018 ended up with a negative sign before your total return.“– bto: Das wissen wir bereits aus den Daten der Deutschen Bank. „Of the asset classes that traditionally have meaningful allocations in institutional portfolios, only the Bloomberg Barclays U.S. Aggregate Bond Index (Agg)(…) gave a positive return in U.S. dollars – and it earned a princely +0.01%.Otherwise, pretty much everything was down. The S&P 500 fell 4.4%, soundly trouncing both MSCI EAFE (down 13.8%) and MSCI Emerging (down 14.6%). Real estate proved no hedge, with REITs falling 4.6%, and small caps were even worse than large caps, with the Russell 2000 down 11% and MSCI EAFE Small Cap down 17.9%. Credit was no haven either, with the Bloomberg Barclays U.S. Corporate High Yield down 2.1% and the J.P. Morgan EMBI Global emerging debt index down 4.6%.“ – bto: also kein Vergnügen für Geldanleger. „The best performing major asset worldwide was stodgy old U.S. Treasury Bills, up 1.9%. It was the first time since 1994 that T-Bills beat both the S&P 500 and the Agg, and the first time since 1981 that they outperformed those assets along with non-U.S. equities, small caps, and REITs.“ – bto: Und vorhergesagt hat das niemand. „What feels so odd about 2018 was the sheer unavoidability of the losses. In 2008 you could at least daydream about having had the foresight to move your portfolio to government bonds and reap a +12.4% return. There was no such haven asset in 2018. Had you had perfect foresight about asset class returns for the year, the best your long-only portfolio could have achieved was +1.86%, earned by investing your entire portfolio in 3 month Treasury Bills.“ – bto: So ist es, wenn alle Assets gleichermaßen nur einen Grund haben zu steigen. Das Geld der Notenbanken. 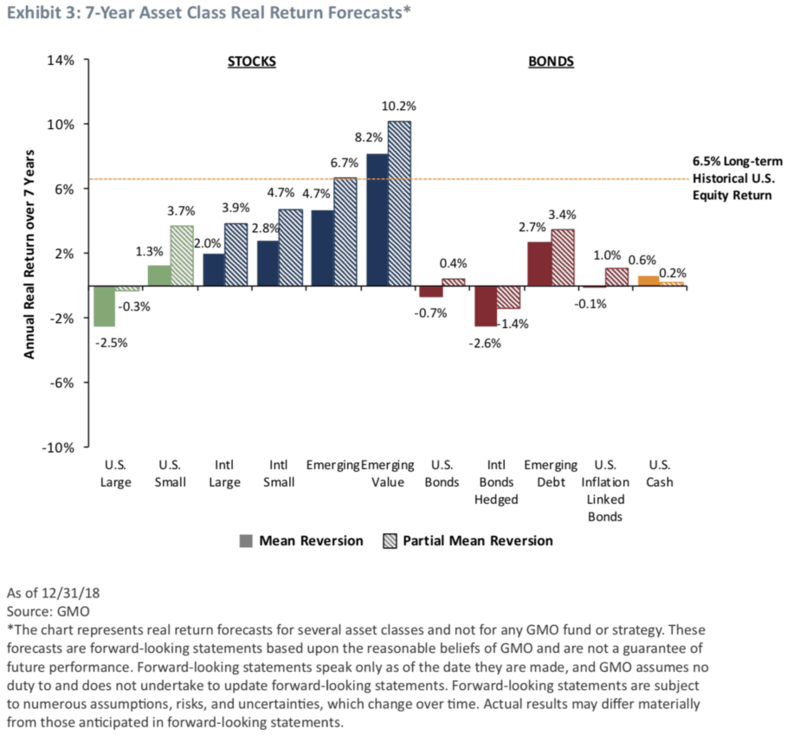 „The other interesting feature of the year was the fact that the broad swath of losses across asset classes was not driven by any particularly horrible economic events. According to the IMF World Economic Outlook report, real GDP growth for the 12 months ended June 2018 was +3.2% U.S. dollar weighted and +3.7% purchasing power parity weighted. These were the best growth rates since 2010 and 2011, respectively. World inflation, while up 0.6% from 2017 at +3.8%, was below the average level since 2000.“ – bto: Nun wissen wir aber, dass die globale Liquidität langsamer gewachsen ist und sich zumindest bis vorletzte Woche eine weitere Verknappung ankündigte. „The simple answer is that markets came into 2018 with an unrealistic set of expectations, and more or less all of them were disappointed. Bond markets assumed inflation and growth would be so muted as to dissuade the Federal Reserve from raising rates four times, as it had suggested was its plan. Stock markets assumed growth would be strong, and appear durable, driving earnings and the expectations for future earnings high enough to keep stocks competitive with the higher yields available on cash. Credit markets assumed that growth and inflation would be muted enough to keep rates low, but corporate cash flow high enough to keep default rates at cycle lows. (…) As it turned out, growth was too strong for the bond market’s liking, and too weak for the other asset classes. It is a clear reminder of the truth that it doesn’t take a disaster to lead markets to losses, only a disappointment.“ – bto: Und diese Erwartungen schlagen sich meist in zu hohen Bewertungen nieder. „(…) it makes sense to focus on situations where the odds of a positive surprise are better than average. When are the odds of a positive surprise better than average? When expectations are really low. Low expectations do not guarantee a good outcome, but they do allow for decent outcomes in the absence of what most investors would consider to be ‘good news’.” – bto: Deshalb habe ich auch auf englische Aktien gesetzt. Vermutlich zu früh, aber aus eben dieser Logik. „(…) the winner for the year was Russia, with a return of +0.2%, despite a stock market consisting almost entirely of energy, materials, and financials; an ongoing war with one of its neighbors; significant economic sanctions; and real GDP growth of a paltry +1.4%. The best thing one could say about Russia in 2018 was that things could have been worse, and with some of the cheapest valuations in the MSCI All Country World Index (ACWI) coming into 2018, it was priced for some pretty nasty events.“ – bto: weshalb ich Russland ebenfalls empfohlen hatte. Der Ertrag war zugegebenermaßen nicht überwältigend, aber immerhin besser als die anderen Märkte. Nun zum Ausblick. Zunächst hält GMO fest, dass es schwer sein wird, die Erwartungen in den USA zu erfüllen: „Achieving forecast growth for the S&P 500 implies corporate profits moving decisively above any previous peak relative to GDP. This is possible, but why stick your neck out investing in the one region of the world where meeting expectations requires something never seen before?“ – bto: Das ist deckungsgleich mit den Berechnungen, die ich letzte Woche hier gezeigt habe. „It seems highly likely that either stock investors or bond investors are going to wind up disappointed. Growth strong enough to make the stock market happy is very likely to push the Fed to disappoint bond investors and raise rates. An economy weak enough to cause the Fed to lower rates in the face of currently very low unemployment seems extremely unlikely to show earnings growth of anything close to 16%. It actually seems quite possible that we could see a repeat of 2018 for the U.S. at least, with both stock investors and bond investors disappointed with the outcome.“ – bto: Das ist jetzt für die USA. Aber es leuchtet ein und dürfte weltweit ausstrahlen. „(…) as a rule, investing where success requires something never seen before seems a lot harder than investing where business as usual would count as a significant positive surprise.“ – bto: so man das in einer Welt, die von der Geldpolitik völlig verzerrt ist, noch finden kann. Womit sich das Ergebnis der „mechanischen Berechnung“ künftiger Erträge zeigt: „(…) we generally ignore their forecasts and instead assume that things will gradually wend their way to normalcy. It should not come as a surprise, however, that our forecasts line up quite similarly to the ‘inverse of expectations’ ordering. Our forecasts show both the partial mean reversion and full mean reversion scenarios.“ – bto: „Partial“ bedeutet nichts anderes, als dass es zu keiner vollständigen Anpassung an die langfristigen Werte kommt und eine Abweichung länger bestehen bleibt. „While the U.S. looks better on our data than it has in a while, it still has a forecast meaningfully below cash in either scenario. But non-U.S. developed equities are a good deal better than cash, and emerging equities even better, at about fair value versus history. We believe combining those reasonable valuations with value spreads much wider than average means there is suddenly a fairly wide array of cheap stocks to buy. The attractiveness of credit is also on the rise, with emerging debt looking a bit cheap on our data and U.S. corporate high yield at approximately fair value as of year- end. Even cash itself has a higher yield than any time since January 2008. It is the first time since 2009 that we have seen such a wide swath of assets this attractively priced.“ – bto: Was doch ein kleiner Einbruch so bewirkt! „To me this is a bit reminiscent of the world at the end of 2000, where despite meaningful losses for the year, the S&P 500 was still substantially overvalued, but other asset classes, having fallen along with the S&P, were rapidly getting cheap.“ – bto: Es ist also möglich, sich so zu positionieren, dass es mehr Chancen als Risiken gibt. Zustimmung bei Russland mit Beimischung/deutliche Übergewichtung. D+Schwellenländer(ohne Russland) sollten durch starke Abhängigkeit vom Welthandel weiterhin hohe Korrelation an den Aktienmärkten aufweisen. Die GMO-Beiträge finde ich immer interessant. Aber die Frage: Kommt es in den derzeitigen Währungen noch einmal zur Mean Reversion? Vielleicht sehen wir seit 2008 einen ZB-gemanagten Crack-up-Boom in Zeitlupe? Wie so oft, bleibt Gold mal wieder komplett unerwähnt. Durchaus wahrscheinlich, dass – wie in 2018 – auch in diesem Jahr Gold die einzige Anlageklasse mit positivem return sein wird. Gold auf der einen, Papier auf der anderen Seite.